Feel your adrenaline pump with this 75ft long obstacle course. 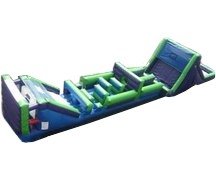 Enter unit and climb then slide down in to fun filled obstacles followed by a rock climb and another big slide. This extremely fun challenge requires teams of 4 to do their part in a relay race and pass off the baton to their teammates. This comes with batons, instructions, and a written lesson to take away from the activity.